Jaguar Casino is an online gambling website that offers many exciting ways to win real money on different games. It is a fun and thrilling place to play table games and slots. The company offers a wide array of games to play- there is something for everyone. Join tournaments and move up the weekly leaderboard to win prizes. Try your hand at the plethora of table games Jaguar Casino offers. Play baccarat, three hand poker, blackjack, or roulette. The website also has a nice selection of instant win games like Slingo, bingo, and scratchers. If you are a fan of slots, you are in for a treat. Jaguar Casino offers different themed slots with huge chances to win major jackpots. These different themes include animals, nature, food, fantasy, exotic places, and holidays. Check out fan favorite slots like King Kong Cash, Persian Fortune, Pixie Wings, and Extra Chilli. Or if you are looking for a unique and exclusive play experience, try out the following slots, Mummy Cold, Cave Raiders, and Get Fruity. Signing up is easy and free. Be sure to register and get additional perks for your first deposit. Jaguar Casino offers a generous welcome package with plenty of free bonus spins gifted. The company has a comprehensive loyalty program for their VIP members. Being a VIP player has many benefits. Get special gifts, increased deposit limits, quicker withdrawal times, exclusive promotions and reloads, and your very own personal account manager when you become a VIP member. Your membership does not expire, so you will be a VIP player for life. There are two types of VIP memberships: Premier and Elite. Enjoy Jaguar Casino games knowing that they use the latest and most secure encryption technology available on the market. Your private information and winnings are in good hands and this will give you great peace of mind as you play your favorite game. The company also provides 24/7 customer support to players who need assistance. Jaguar Casino believes in fairness in the games. Therefore, their games use the Random Number Generator (RNG) in order to make the games impartial. The RNG works to generate completely random results so things remain objective. The RNG is strictly monitored by a group of certified experts. These experts belong to a reputable industry testing company that is fully accredited and completely legitimate. These workers monitor the performance of the company’s games continuously and publish payout reports regularly to ensure unrigged and fair gameplay. Players can take comfort knowing that the House does not always win. The company also encourages the Responsible Gambling policy. This means that they have a well-trained support team that helps those that start to develop a gambling problem. They have several ways to help players who are having issues. These include: establishing deposit limits so that the player can limit how much money is spent on the games; temporarily disabling the player’s account so that they can take back control of their gaming habits; a Reality Check feature that allows the player to see how much time is spent playing their games. Deposit limits can be adjusted by day, week, or month. Accounts can be disabled and timeouts can be taken for up to several months. Jaguar Casino offers additional resources for individuals seeking assistance if requested. First 3 deposits only. 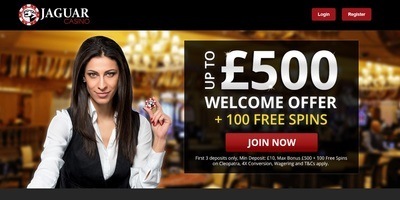 Min dep £10, Max bonus £500 + 100 FS on Cleopatra, 4X Conversion, Wagering T&C apply!